TXAB: The Christ Almighty Blog: The cycle: The good old days, and the dark times. Prosperity. Peace, comfort, and relative success. The scriptures attribute it to God. We humans just as often attribute it to ourselves, forget God, and forget the last time the Cycle went round. And so it starts all over again. Apostasy. Since we have few needs, God isn’t petitioned, isn’t followed. Religion gets sloppy, abandoned for other pursuits, or replaced with something new. Irreligion, or apathy, is passed down to children; many of whom decide to look elsewhere. Unblessing. Up to this point, God’s been protecting us from natural and artificial disasters. That ends. Oppression. Prosperity ends. Disaster strikes. Famine. The economy collapses. Enemies take advantage of a prosperity-focused, ineffective government, ill-equipped to defend the weak. Those who hold our debts force us into subservience. Repentance. We finally stop blaming others for our misfortunes, and ask ourselves what we can do to set things right with God. Revival. A return to religion, as people go back to wholeheartedly following God and calling out to him for help. Deliverance. God raises up anointed leaders (in the scriptures, judges) to defend his people from their foes. Sometimes with war. Sometimes prophecy. Sometimes other reforms. …And then back to prosperity. And after a time, apostasy. And so on round the Cycle. 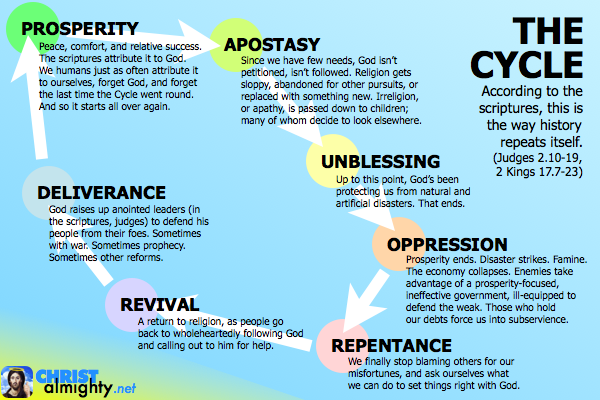 The Cycle in the scriptures. Israel followed God and went through prosperity. Then Israel forgot God and slid into apostasy. Then God turned off the blessings and took the side of their oppressors. Then oppression. Sometimes a nearby nation conquered Israel (or some of its tribes) and made it a tributary nation. Sometimes they full-on dragged ’em into captivity. Sometimes they did nothing more than raid its borders and hassle its citizens. Finally the people realized God could solve their problem. Followed by an outbreak of religion, prayer, following the Law, and so forth, in hopes God would remember his relationship with Israel and save them. And then God saved ’em, and they had several years of prosperity… and round we go again. True, we don’t see the Cycle so much in the New Testament. Mostly because it covers a much briefer time period. Between Abraham and Malachi, the Old Testament covers maybe 17 centuries; the New Testament only about 30 years. That’s not enough time for a full Cycle. What we’re seeing in the New Testament is only a segment of the Cycle: The Romans signify the oppression, John the baptist signifies the revival, Jesus the deliverance, and God’s kingdom the eventual prosperity. But not everyone in first-century Israel recognized the need for repentance… which is why they wound up crucifying their Savior. 10 Once all Joshua’s generation joined their ancestors, another generation came after them. They didn’t know the LORD. Nor the work he did for Israel. 11 Israel’s descendants did evil in the LORD’s eyes. They served the Baal pantheon. 12 They abandoned the LORD, their ancestors’ God, who brought them out of Egypt’s land. They followed other gods, the gods of the other peoples around them. They worshiped them, and provoked the LORD. 13 They left the LORD, and served Baal and Astarte. He put them in the hand of raiders, who raided them. He sold them to the hand of their enemies around them. They weren’t able to withstand their enemies’ face any longer. like the LORD had spoken of, like the LORD swore to them he’d forcefully hold back from them. 17 but Israel didn’t listen to his judges, for they were “doing it” with these other gods. They worshiped them. They hurried to abandon the ways their ancestors walked. Ancestors listened to the LORD’s commands; they didn’t do likewise. The LORD rescued them from the hand of their enemies for all the days of the judge. in the face of those who pressured and crowded them. 19 Then when the judge died, they backslid: They trashed what their ancestors did. They followed other gods, to serve and worship them. They didn’t repent from their deeds, from their hard ways. this nation violates the relationship I assigned their ancestors. They won’t listen to my voice. 21 So I’ll no longer dispossess the people ahead of them, the nations still there when Joshua died. And sometimes they did walk the LORD’s way. And sometimes not. The Cycle and the churches. There’s an old saying you’ll hear in history classes: Eastern cultures see history as cyclical; whereas western cultures see it as a straight line, with a beginning and end. In part that’s true. Y’see, western cultures have been heavily influenced by the New Testament, and as I said, we don’t see the whole of the Cycle in the NT. Just a segment of the arc. For this reason, you’ll find many western Christians who insist Jesus broke the Cycle, so it’s over: It was part of the old dispensation, when people had to be saved by good works, but now that we’re saved by grace, no more Cycle. It did its job, but its time has passed. How do these folks interpret human history? For the most part they take the rest of the downward arc of the Cycle (apostasy, unblessing, oppression) and stretch it out till the End. The world, they insist, is getting worse and worse and worse. Someday it’ll be so bad, God simply has to intercede and put an end to it. Meanwhile, us Christians are an oasis in the middle of this awful world: In our group—and only in our group—the Cycle’s going upward (repentance, revival, deliverance). While individual Christians and individual churches may fall away, Christianity as a whole has always gone onward and upward. And always will. Now, if you know actual world history, you’ll know this is poppycock. Christianity goes through the Cycle, same as the ancient Hebrews, same as every culture. One generation followed Jesus with all their hearts. The next, with about half their hearts. The generation after that… well, their parents sucked at passing Christianity down, so they might’ve called themselves Christian, but they were functionally pagan. The fourth generation: Unapologetically pagan. Sometimes it doesn’t even take four generations. Sometimes only one. Yes, when we actually do our job and pass our own relationships with Christ Jesus down to the next generation of Christians, we can actually stop the Cycle. For now. ’Cause that’s the problem: We might be vigilant and do our job of passing Christianity down, but the next generation may not be so cautious, and might drop the ball. It’s what we see in a lot of spiritually-dead churches. Every denomination (except the heretic ones) is the product of a revival. But while the first generation was on-fire for God, the second wasn’t always, the third less so, the fourth even less so… and nowadays, all you find in that institution are instructions on how to play church. The Holy Spirit left once the Christians died off. Happens all the time. Shouldn’t. But those who don’t learn from the past… well, they assume Christianity stopped the Cycle, and get a very screwy idea about how history works. History repeats itself. Read your Old Testament. Read Judges in particular. Learn your history. And stop repeating it.